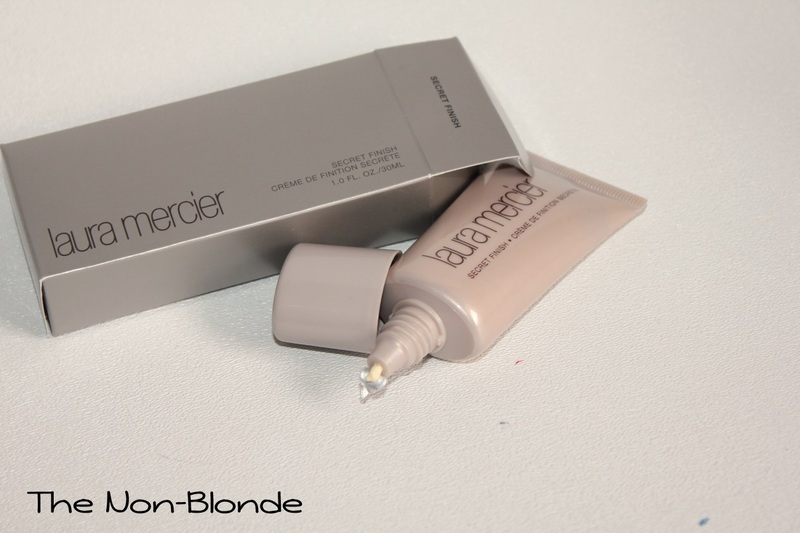 It took me several weeks to make friends and figure out the best way to use Laura Mercier Secret Finish. The people at Laura Mercier weren't kidding when they said that Secret Finish works best on the eye area-- anywhere else on the face I still think that a good spritz of an hydrating mist (see my reviews of products from Suqqu, Youngblood Minerals, and Laura Mercier) is a better option for freshening up or to get rid of a powdery look. But I don't like spraying too close to my eyes, and that's often the spot that needs a pick-me-up treat the most. Enter Secret Finish. "Instantly gives a moist and natural looking glow to the skin"
It really does, when you know what you're doing. The texture of Secret Finish is surprisingly thick. It requires a very light hand: you only need to take a small drop, rub it between your fingers and pat the area very gently. Don't rub! I've discovered that no matter how much concealer, brightener, or any other makeup I have there, nothing moves. The skin actually looks hydrated and rather glowy, so you can also experiment on other parts of the face where a dew finish is welcome. The top of the cheekbones are also a good place, though if you're wearing a Chanel cream blush they might not go well together. Since the main ingredient in Laura Mercier Secret Finish is water, I'd go out on a limb and say that it works best over other water-based products. Basically, Secret Finish is the equivalent of a very fortifying face mist for the eye area. It's especially useful if your makeup is still nicely in place after several hours but you feel like you could use a boost before going out out. Laura Mercier- Secret Finish ($27) is available at the counters and from lauramercier.com. I have this and have never figured out how to use it properly. Thanks for the experimentation and the review! I was so impressed with this when the SA tried it on me, I had to buy it. A really lovely product!